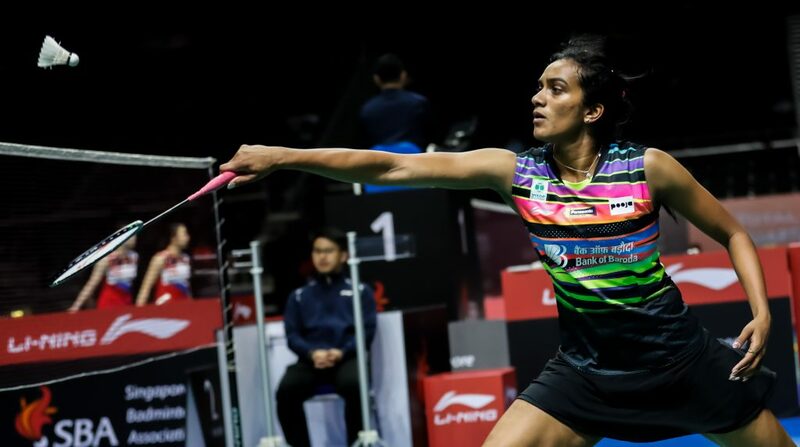 A crowd of around 4,600 saw spectacular badminton action at the Singapore Indoor Stadium as the semi-finals draws were firmed up at the Singapore Open on April 12. Anthony Sinisuka Ginting (INA) lived up to his “giant killer” reputation as he trumped Olympic champion Chen Long (CHN) to move into the semi-finals. Ginting (above) beat the two-time world champion 21-8, 21-19. “When the head-to-head is in your favour, your confidence will be there as you pretty much know how the other player plays. I also review my previous matches to refresh my memory and the strategy that I used before,” said Ginting. Reigning men’s singles champion Chou Tien Chen (TPE) moved into the semi-finals but not before India’s Sameer Verma extended him to a third game. Chou pushed on to win 21-10, 15-21, 21-15. “I was too eager to attack in the second game and in the decider I had to stay focused and play like I did in the first game. I’m glad that I won the match,” said Chou. Chou will face Ginting in the semi-finals. In arguably the most anticipated match of the night, Viktor Axelsen (DEN) emerged victorious against Indonesia’s Jonatan Christie after an hour and 20 minutes, the longest match of the day. The Great Dane beat Christie 22-24, 21-18, 24-22 to claim his place in the semi-finals against BWF World Champion Kento Momota. “Tired and happy. I felt that it was very fun, but of course winning is the most fun. I felt my opponent played well. Just last week I lost to him (Christie) so I’m happy that I won this week. However, I felt that I was lucky, but that’s part of the game,” said Axelsen (above, left). Momota survived his own scare after India’s top men’s singles player Kidambi Srikanth took him into a third game. The world ranked #1 Momota managed to beat Srikanth 21-18, 19-21, 21-9. “The opponent is always on the attacking mode. I managed to win when I increased my speed. It is very difficult but I endured, that’s why I could win,” said Momota. 21-13 win over sixth seed Saina Nehwal (IND). The Japanese will face Indian badminton star Pusarla V. Sindhu in the semi-finals. Sindhu won her match 21-13, 17-21, 21-14 against China’s Cai Yanyan. World #1 Tai Tzu Ying (TPE) edged out seventh seed Sung Ji Hyun (KOR) 21-11, 17-21, 21-16. The Taiwanese advanced to the semi-finals where she will play Akane Yamaguchi (JPN). “My opponent started with many errors. I also had some errors, that’s why I lost the second game. I was trying to finish in two games but during the second game I started making errors because I was too eager. Although we played three games, I’m satisfied with the result,” said Tai. Yamaguchi beat Thailand’s Ratchanok Intanon 21-13, 21-17. “I did well today and therefore tomorrow I will also give my best. I will try not to lose and give a satisfactory performance,” said Yamaguchi. In an all-Japanese clash, top seed and world ranked #1 Yuki Fukushima and Sayaka Hirota (below) beat compatriots Ayako Sakuramoto and Yukiko Takahata 21-17, 23-21. “Japanese have fighting spirit and this match was a test of endurance. I am very happy that we were able to win. Our points were very close and we can only take things a step at a time,” said Fukushima. They will next face their compatriots Mayu Matsumoto and Wakana Nagahara. The BWF world champions beat Chinese pair Li Wenmei and Zheng Yu 21-17, 21-19 to book their spot in the semi-finals. China’s Liu Xuanxuan and Xia Yuting will challenge Kim Hye Jeong and Kong Hee Yong from Korea in the other semi-final. The top ranked Marcus Fernaldi Gideon (INA) and Kevin Sanjaya Sukamuljo (INA) dispatched compatriots Fajar Alfian (INA) and Muhammad Rian Ardianto (INA) 21-18, 21-10. The two Indonesian pairs met at the Malaysia Open last week and Alfian and Ardianto came out on top. the previous match, we made a lot of errors and we were less accurate in our placement,” said Gideon. ictory over Malaysian pair Goh V Shem and Tan Wee Kiong. The Indonesian duo won 18-21, 21-16, 21-17. “In the beginning, we lifted a lot of shots and many of them were out. In the second game, we tried to change our game plan to play more at the front of the court. We managed to get a lot of opportunities to attack and we think that worked better,” said Setiawan. Ahsan and Setiawan have a tough tie waiting for them in the semi-finals. They will face world champions Liu Yuchen and Li Junhui from China. Japan’s Yuki Kanek and Misaki Matsutomo 21-12 21-7. The Chinese pair will face Dechapol Puavaranukroh (THA) and Sapsiree Taerattanachai (THA) in the semi-finals. In the other mixed doubles semi-final, Indonesia’s Hafiz Faizal and Gloria Emanuelle Widjaja will take on the Malaysian pairing of Tan Kian Meng and Lai Pei Jing.